"In The Stone Age. 'Gimme a stack of reds!'" 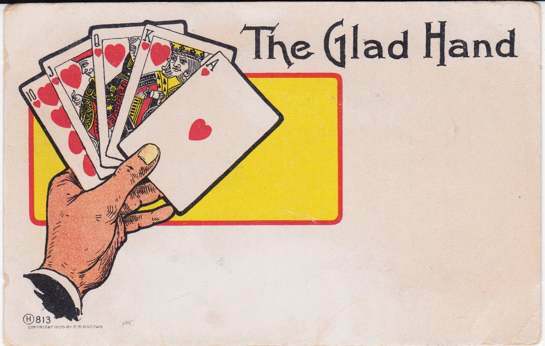 The postcards appearing below on this page were used to invite players to playing card games such as poker and whist. 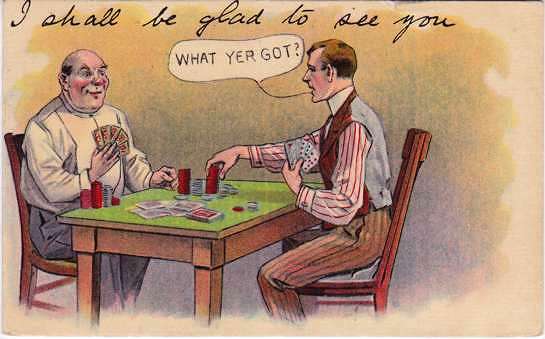 They are about 100 years old, a time when playing card games were a common form of leisure entertainment, a time when there was no internet and very few telephones. In 1900 the U.S. had a population of 76,000,000 people and 600,000 phones. In 1910 the numbers were 92,000,000 and 2,200,000. Thus, the Post Office was the most convenient way to send out game invitation information. 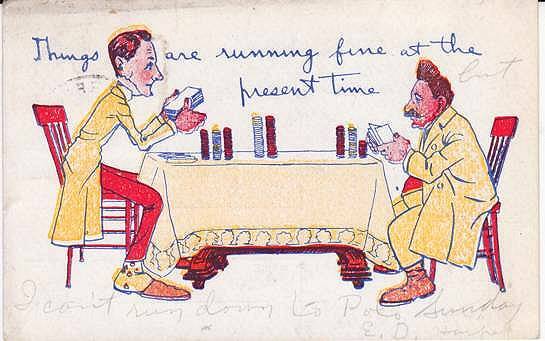 The postcards shown below (all from my collection) were all probably made to inform players of the date, time and location of the card games, as indicated by the poker theme on the postcards and the blank space provided to write pertinent meeting information -- space not large enough to write a normal message, but small enough to write the date, time and place of the next game. The cards shown first below were definitely made for that purpose -- it is explicitly stated as such on the cards. 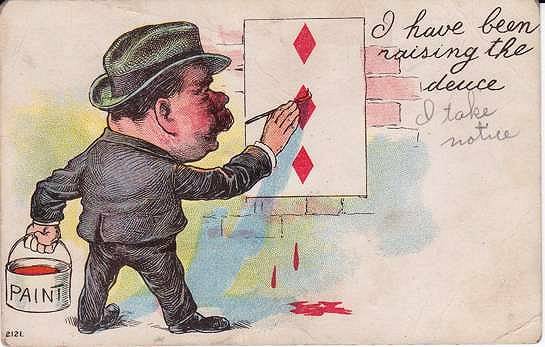 Picture postcards came into vogue in 1893 at the Columbian Exposition in Chicago. 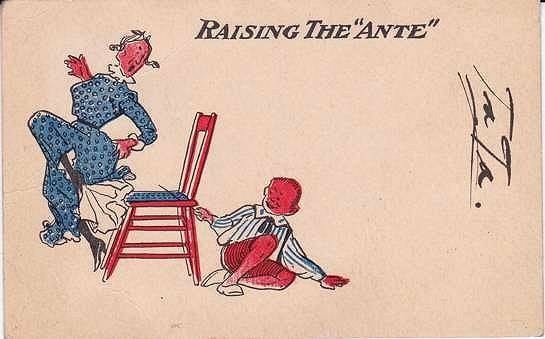 Except for 2 years during WW I, the postcard postage rate was 1-cent until 1952. In the beginning, no messages were allowed on the address side of the cards. In 1907 "divided backs" were allowed: the left side could be used for messages, and the right side was for the address. 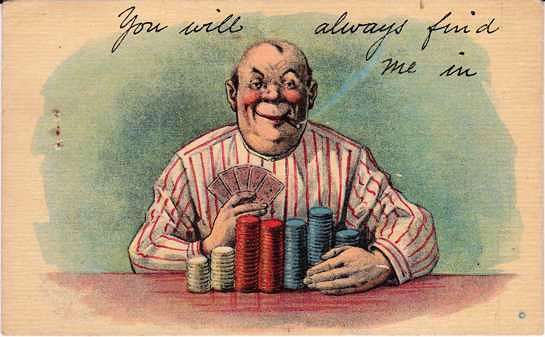 Click here and here for excellent information for histories of postcards and tips to determine the ages of postcards. My best postcard of this type. Note the top of the card where one would put the date and the time of the game. On the bottom, where it says "FROM," one would put the name and address of the host. 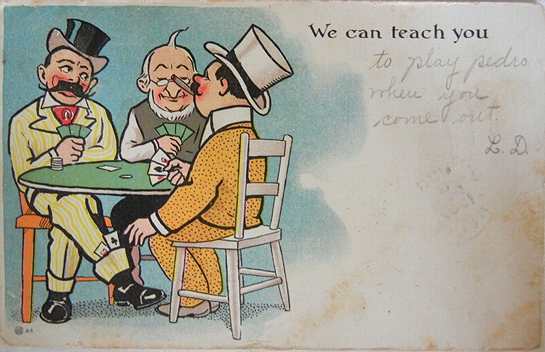 Says "Copyrighted 1910, by S.A. Solomon." A divided back card. The card has no writing, no stamp. Printed where the stamp would go: "United States and Canada One Cent. Foreign, Two Cents." Another one of my best "invitational" poker game postcards. It is plain as day as to where the game details go. A divided back card -- no message or stamp there. 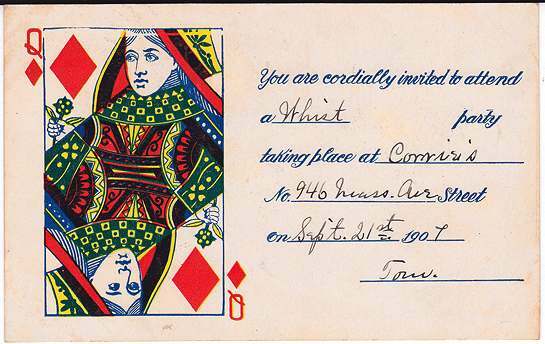 This could have been used for a poker game, but instead was used for an invite to a "Whist Party." 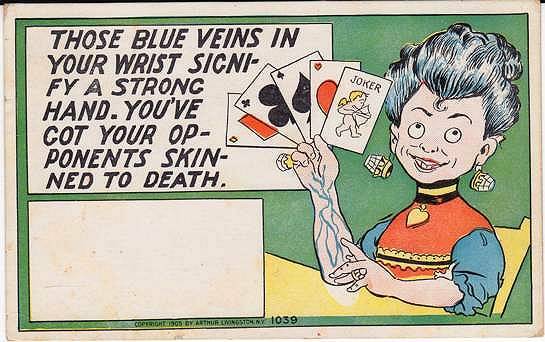 Whist was a popular card game at the time (similar to bridge). Divided back. Manufacturer's mark: IPC Co. 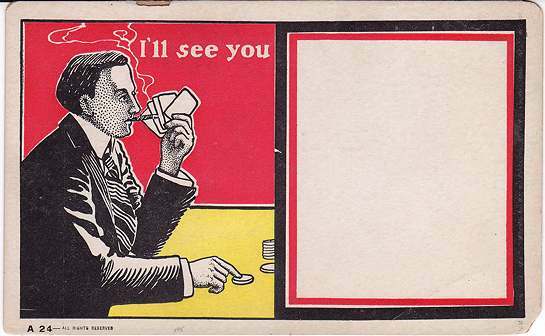 Wonderful; "I'll see you." 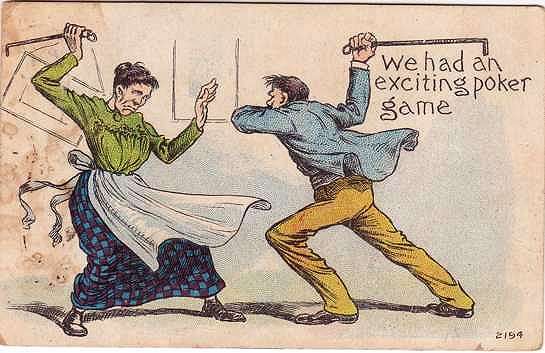 Double meaning -- call a bet, and nice white box to write down the date, time and place of the game! Back is for address only. No writing or stamp. Calls for One Cent stamp. Another "I would like to see you." Big white space for the game meeting details. P. D. Sullivan, the manufacturer. Back for address only. No writing or stamp. Calls for one-cent stamp. 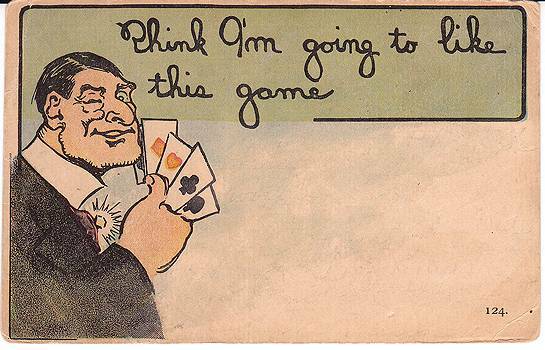 Nice inducement in the invitation: man is holding 4 aces, and says to self, "Think I'm going to like this game." Lots of blank space for meeting details. Stock number on front: 124. Back is divided and written on, and there is a one-cent stamp, cancelled 1909. 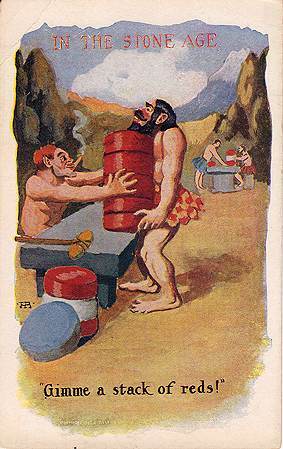 The card was sent to a Martin in Moor Park, California. 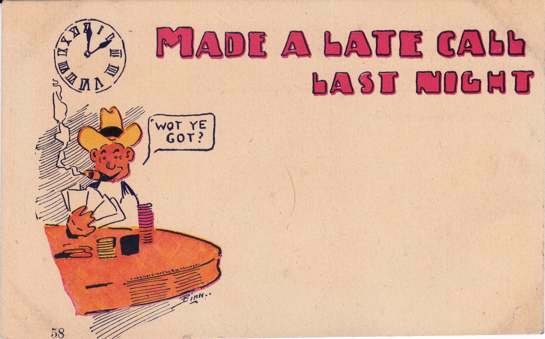 Almost certainly made as an invitation to a poker game. 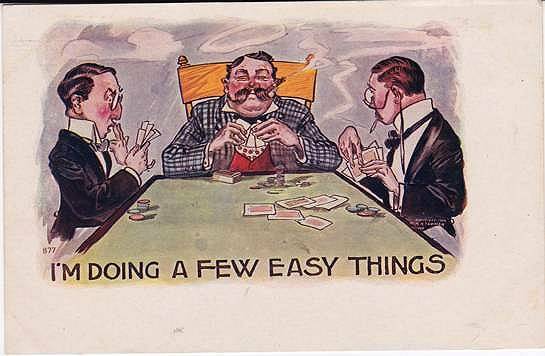 Undivided back for address; 1-cent postage stamp attached, postmarked 1907..... Men playing cards, one cheating with two cards in pant cuff. Clearly meant to be an invitation postcard. Mint, divided back with space asking for 1-cent stamp. Note the large space on the front which screams "poker game invitation." Another one with a space for an invitation on the front, any message as well since the back side is for address-only. "H 813, copyright 1905 by F. S. Backus." Small white box is undoubtedly for poker game directions, especially since there is an undivided back to the postcard for address only. 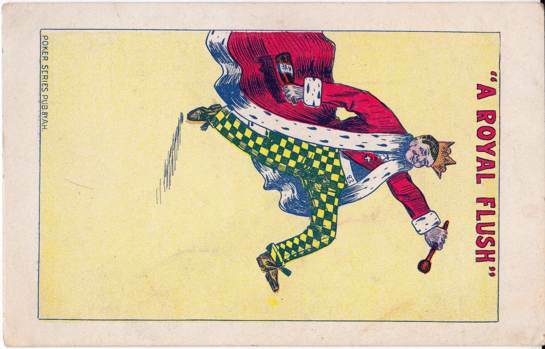 "Copyright 1905 by Arthur Livingston NY ... 1039." The back says address only, has a one-cent stamp cancelled 1907. Undivided back is for address only, so the small white portion in the front must have been intended for poker game invitation and directions. Back is for address only and 1-cent stamp space. Space on left must be for poker game invite and instructions, especially since the back says address only and space for one-cent stamp. "Adolph Selige Pub. Co., St. Louis Mo." Poker game invite and instructions could go either on front on table cloth or under table; or on back which is divided (space for message and address). "AH" logo on back, and cancelled 1-cent stamp, w/ illegible date. Obvious space on right for poker game invite and instructions. Divided back for message and address, and space for 1-cent stamp. Divided back for another message and address and cancelled 1-cent stamp, cancelled 1907. 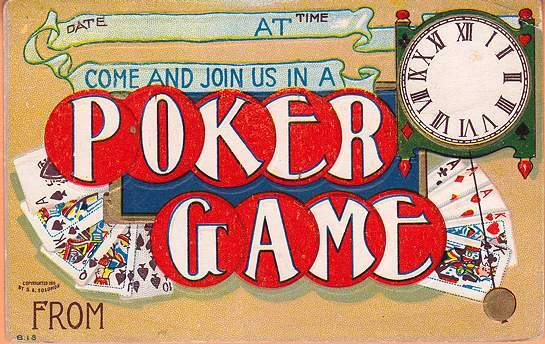 Obvious space on right for poker game invite and instructions. 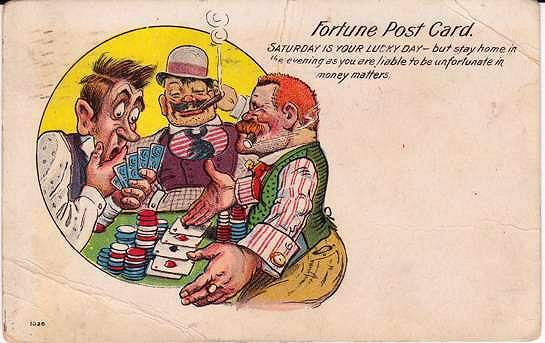 Must have been intended for a day game as the printed message says, "Fortune Post Card. Saturday is your lucky day, but stay home in the evening as you are liable to be unfortunate in money matters." 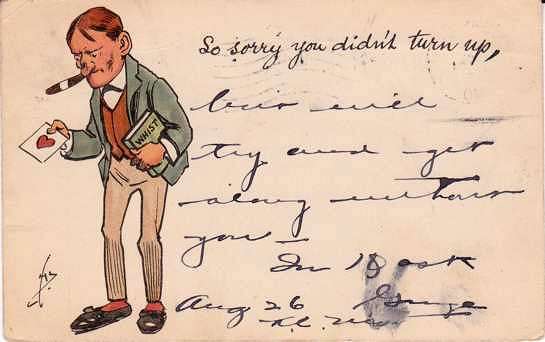 Divided back for another message and address and cancelled 1-cent stamp, cancelled 1909. Note the space for the invitation information. "Poker Series Pub. by A.H."
Back side is undivided, for address only. Lovely postcard. Ideal for any kind of invitation, which would have to go on the reverse side. On the back side: divided back, used, written message, 1-cent stamp and 1913 post office cancellation. 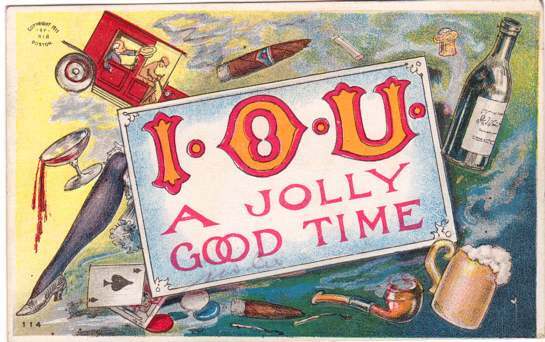 You can't see it via a picture, but the postcard is nicely "embossed" -- the objects such as the cigar, beer mug, pipe, cards, etc. stand out! "Copyright 1911, by HIR Boston." "So sorry you didn't turn up." Surely could be used for an invitation postcard. Note the book says "Whist." Lots of space on the frontfor the message. Undivided back, 1905 cancellation, Kansas City. "I shall be glad to see you." 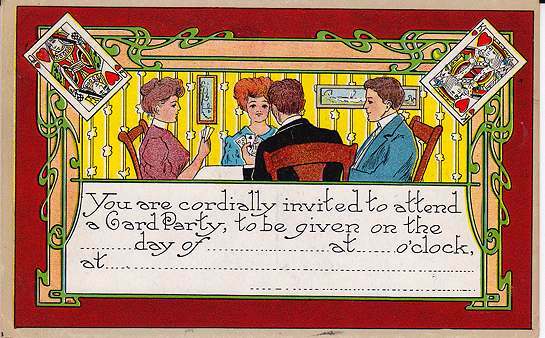 Ideal for a card party invitation. Divided back. 1911 cancellation, Brooklyn NY. "You will always find me in." 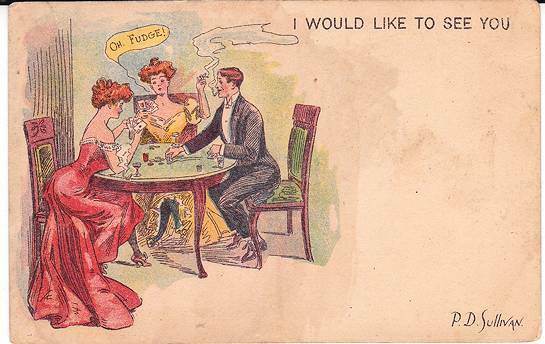 Perfect postcard for an invitation. The message on the back reads, "Tomorrow night if it don't rain." Divided back. Pittsfiled. No date anywhere. 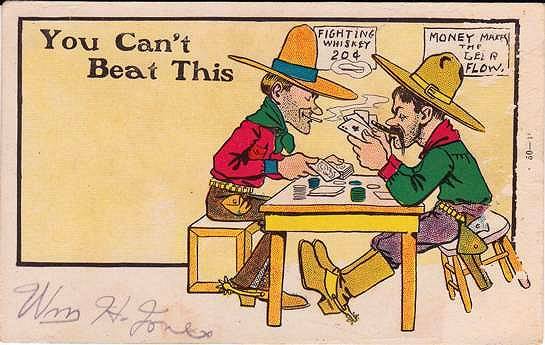 Postcard is "Comic Series Number 16, copyright 1910 by J J Marks, NY." "We had an exciting poker game." They are fighting with pokers. Divided back, 1907 cancellation. Marvell, Ark.